A few months ago I bought a new (to me) car. 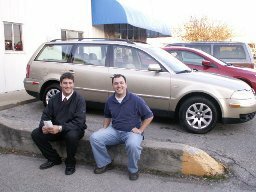 A great little gold VW passat wagon, 2001 with 58,000 miles, 4 cylinder, turbo. This purchase was not done on a whim. I researched it for nearly 2 months. I was tired of my old beat up van with all the paint chipping off and the passenger door stuck shut, no AC and usually no radio. It was time for a change. Edmunds was a great resource as was Cars.com. Most important to me was #1 affordability, #2 fuel economy, #3 reliability, #4 storage. And I wanted the passenger door to open. Is that too much to ask? The passat showed great reliability ratings and very good fuel economy. I looked at a lot of wagons because I just didn’t want to buy an SUV. Everybody has one and I have to be different. The wagon is great for loading up a lot of things including my guitar. It has a lot of room, I love it! This entry was posted on Friday, February 10th, 2006 at 8:30 pm	and posted in Personal. You can follow any responses to this entry through the RSS 2.0 feed.